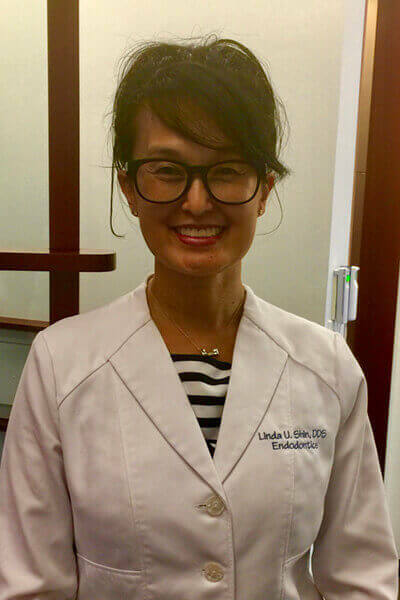 Dr. Linda Shin is an American born Korean, born and raised in Michigan. She has a Bachelor in Science in physiology from Michigan State University. Her studies continued at the University of Michigan where she obtained her graduate degree in Doctor of Dental Surgery. Subsequent to school, she did a residency in general dentistry at the Veteran’s Administration, San Francisco. Upon starting her career, she worked as a cosmetic general dentist, owning her own practice in the financial district and Union Square area of San Francisco. During that time, she continued to teach at the University of California, San Francisco as a clinical faculty member. In 2001, Dr. Shin moved to New York City where she has been raising a family with three children. During her early years, she continued to practice general dentistry and also became an associate faculty member at Columbia University, School of Dental Medicine. It was during this transition that Dr. Shin decided to specialize in Endodontic Therapy at Columbia University. Subsequent to her obtaining her specialty degree, she continued to teach in the Endodontic Graduate Clinic part time. With thirty years of experience, Dr. Shin remains passionate about her career and is eager to maintain the best clinical care for her patients. Her experience with pain management is a top priority to ensure maximum patient comfort. She is a member if the American Association of Endodontists and continues to take courses to educate herself in the most current techniques in her field of expertise.